Yes, you can also pull the dewy K-beauty look off! Dewy-skin devotees will tell you that you don’t need to follow a 10-step skincare routine to get the look. Achieving the chok chok effect, whether you have pale mestiza skin or a warm morena complexion, is not as complicated as you think. Having a clean base is the first step toward getting bouncy, baby-like skin. The practice of cleansing, exfoliating, and toning rids pores of dirt and grime, sloughs away dead skin, promotes cell turnover that prevents aging, and prepares the skin to better absorb the next steps in your routine. Look for gentle, alcohol-free products that are formulated with humectants such as hyaluronic acid and glycerin, both of which help the skin retain its natural moisture. Moisturize like your life depends on it. Dryness stands in the way of clear, dewy skin, which is why constant moisturizing is key. Korean beauty experts recommend using a lightweight, moisture-boosting essence or serum before layering on a nourishing cream or gel that can help fight the appearance of fine lines and wrinkles. Go easy on the foundation. There's no need to pile on the foundation when you have a great base to start with, like vlogger Say Tioco. Let the results of your skincare regimen shine by opting for a lightweight, non-greasy base that will make you feel like you're not wearing anything at all. You can go out without foundation, but, as vlogger Michelle Dy explains, stepping out without sunscreen is a major beauty no-no. UV protection is one of the most important steps in achieving skin that looks soft, supple, and luxuriously radiant. Koreans use sunscreen religiously—they wear it every day even when the sky is overcast. 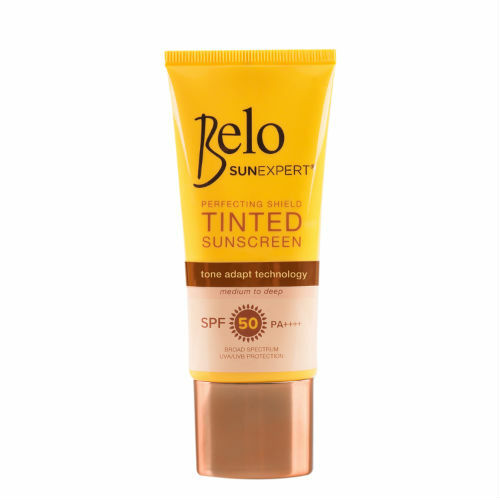 If you find sunscreen too heavy and sticky for you, Belo SunExpert Tinted Sunscreen may be your next best friend. This hypoallergenic SPF 50, PA++++ tinted sunscreen offers protection against skin-aging UV rays while providing coverage. And since it's formulated with Belo's Tone Adapt Technology, it won’t leave Pinay skin looking pale. Visit Belo SunExpert’s Facebook page to know more.